Rustin Concrete is a producer of ready mix concrete in Southeastern Oklahoma utilizing eight concrete production sites in seven counties and forty ready mix concrete trucks. Seven managers run the day to day operations. Aggregates and cement are hauled into the plants on ten tractor trailer trucks. General administration, accounting, and equipment maintenance are centralized at the main office. Other significant sales items are sand & gravel, concrete reinforcing steel, and other miscellaneous materials related to concrete and masonry construction. The company operates a fill sand and fill dirt pit from which materials are delivered on company dump trucks to various job sites. 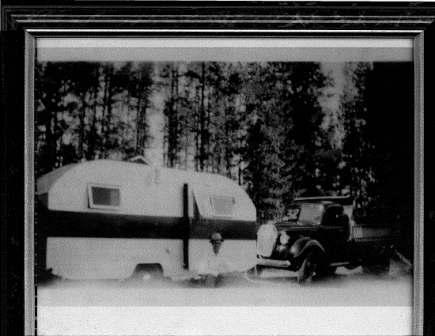 Our family heritage was given to us by our founder who was trained by hard times of the 1920 and 1930. He was also raised and accepted a strong belief in God and a personal relationship with Jesus Christ. He often commented of dreams and encouragement he received from prayer that guided his steps all through his life. This picture is around 1940 while he and his wife were picking cherries in Colorado. They would live off the land in the frozen winter by hunting. The family owned company has an excellent reputation in the region based upon honesty and integrity along with longevity in the market place. 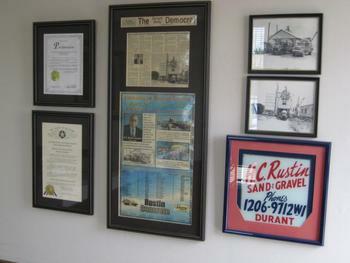 Delivery of quality materials in a timely manner has been the cornerstone of the business since 1951. Second and third generations of the family own and operate the business. 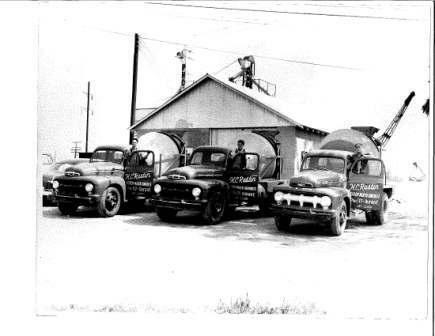 Here is two pictures that were taken around 1953 after they had just added their third truck to the growing fleet of mixers. Commitment to reinvestment in the operations has allowed for steady growth from a single location to the multiple, geographically spread locations in production today. Conservative spending, careful acquisition of other operations, and meeting financial obligations on time have contributed to success in the trade area. This is the very first plant that HC actually draw and built by HC as given to him during on of those guiding dreams in the middle of the night. HC only had a sixth grade education but with the help of the Lord and the school teacher he married, HC taught himself the skills he needed to succeed. Long term employees, other than the family, also positively impact the performance of the company with several key positions being held by individuals with five to twenty-five plus years of service.